While everybody wants to start Sprint Cup races from the pole, drivers hoping to win at Talladega really, really want to start from the pole. The reason: To keep ahead of the chaos of pack racing going on behind. Martin Truex Jr. earned the right to at least start Sunday’s 500-miler at NASCAR’s biggest most notorious track from the safety of the pole on Saturday when he laid down the quickest lap in the final qualifying session. 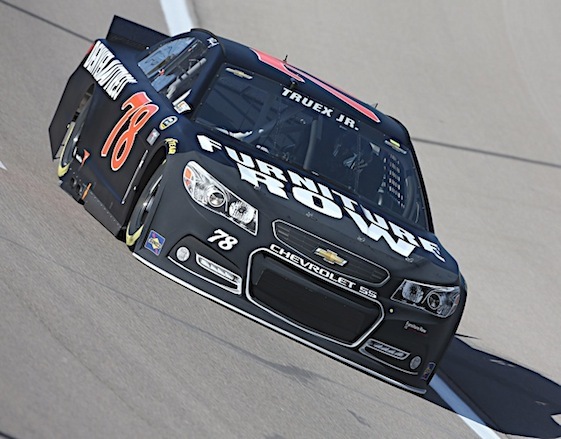 Truex earned the pole with a lap at the 2.66-mile superspeedway in 49.508 seconds (193.423 mph). He will start the race seventh in the Chase standings, and 13 points ahead of Joey Logano and Austin Dillon in the field race of the Field of 12 portion of the playoffs. The pole was Truex’s first at Talladega, his fourth of the season and the 11th of his career. Fellow Chaser Brad Keselowski of Team Penske was second fastest in qualifying as his top lap was at 193.423 mph. Keselowski, too, likes being able to start ahead of potential trouble makers. Keselowski will be going for a career fifth win at Talladega on Sunday and a berth in the Chase’s Field of Eight. Chase drivers Matt Kenseth (193.189 mph) and Chase Elliott (193.166 mph) will start third and fourth, respectively. Elliott is 12th in the Chase standings, likely needing a victory in Sunday’s race to advance to the Round of Eight. Jimmie Johnson and Kevin Harvick already have earned spots in the Round of Eight, which begins next weekend, by virtue of their respective victories at Charlotte and Kansas, leaving six berths available to the remaining 10 drivers. (78) Martin Truex Jr (C), Toyota, 193.423 mph. (2) Brad Keselowski (C), Ford, 193.365 mph. (20) Matt Kenseth (C), Toyota, 193.189 mph. (24) Chase Elliott # (C), Chevrolet, 193.166 mph. (16) Greg Biffle, Ford, 193.123 mph. (17) Ricky Stenhouse Jr, Ford, 192.975 mph. (41) Kurt Busch (C), Chevrolet, 192.746 mph. (11) Denny Hamlin (C), Toyota, 192.610 mph. (3) Austin Dillon (C), Chevrolet, 192.177 mph. (27) Paul Menard, Chevrolet, 192.123 mph. (6) Trevor Bayne, Ford, 192.039 mph. (55) Reed Sorenson, Toyota, 188.300 mph. (19) Carl Edwards (C), Toyota, 192.131 mph. (18) Kyle Busch (C), Toyota, 192.039 mph. (21) Ryan Blaney #, Ford, 192.039 mph. (22) Joey Logano (C), Ford, 192.012 mph. (48) Jimmie Johnson (C), Chevrolet, 191.704 mph. (99) Ryan Reed(i), Ford, 191.700 mph. (88) Alex Bowman(i), Chevrolet, 191.627 mph. (31) Ryan Newman, Chevrolet, 191.466 mph. (14) Tony Stewart, Chevrolet, 190.962 mph. (4) Kevin Harvick (C), Chevrolet, 190.768 mph. (1) Jamie McMurray, Chevrolet, 190.393 mph. (42) Kyle Larson, Chevrolet, 190.162 mph. (44) Brian Scott #, Ford, 190.026 mph. (43) Aric Almirola, Ford, 190.004 mph. (5) Kasey Kahne, Chevrolet, 189.891 mph. (13) Casey Mears, Chevrolet, 189.755 mph. (7) Regan Smith, Chevrolet, 189.688 mph. (10) Danica Patrick, Chevrolet, 189.643 mph. (38) Landon Cassill, Ford, 189.612 mph. (47) AJ Allmendinger, Chevrolet, 189.515 mph. (34) Chris Buescher #, Ford, 189.242 mph. (95) Michael McDowell, Chevrolet, 188.775 mph. (93) Matt DiBenedetto, Toyota, 188.419 mph. (15) Clint Bowyer, Chevrolet, 188.086 mph. (46) Michael Annett, Chevrolet, 187.993 mph. (32) Bobby Labonte, Ford, 187.368 mph. (83) Jeffrey Earnhardt #, Toyota, 186.765 mph. (23) David Ragan, Toyota, 186.358 mph. 1 drivers failed to qualify. (35) David Gilliland, Ford, 188.089 mph.